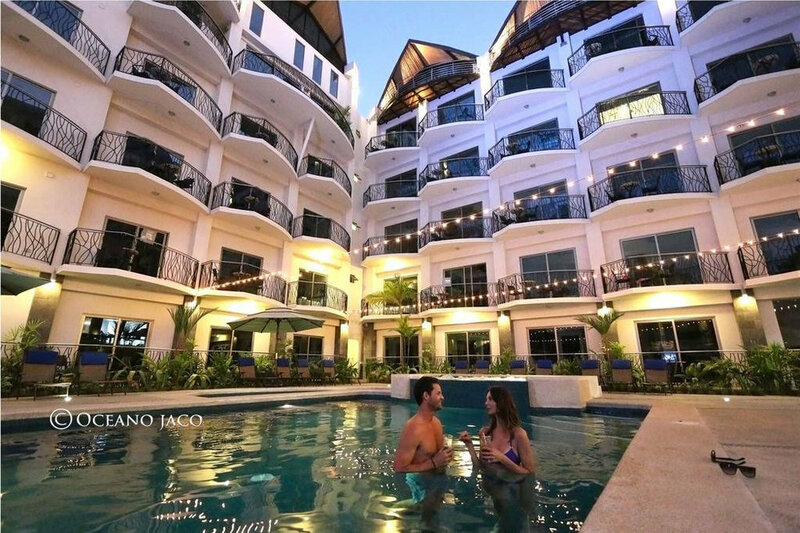 Oceano Boutique Hotel & Gallery is a 6 floor building, consisting of a total of 46 units. 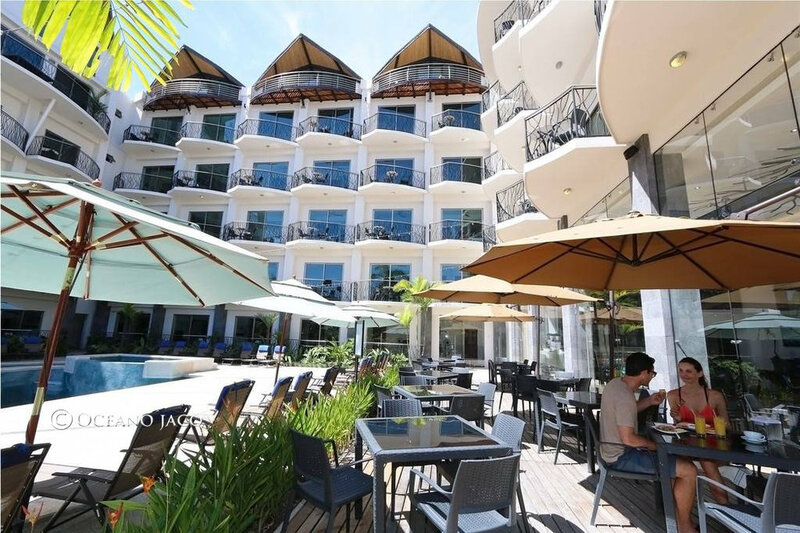 Located in Jaco Beach on the Central Pacific coast of Costa Rica, just a walk away to over 65 restaurants, bars, banks, large supermarkets and attractions. It’s also only a 1 hour drive to Manuel Antonio, 5 minutes to Los Suenos and 5 minutes to Hermosa. Take the new highway east and in only 1 hour, you’re in San Jose with its world class health care, fine dining and shopping. All of Oceano’s units are fully-titled and their owners can choose if they wish to participate in the rental program. Oceano’s marketing expertise and professional hotel management team assure a truly care-free ownership and quick returns on your investment. The on-site management team takes care of all rental activities such as publicity & advertising, bookings, accounting, maintenance, customer service and housekeeping while you’re away; and split the rental revenues 62% to owner and 38% to management. The Monthly HOA Maintenance Fee starts at just $242 (depending on the type of unit), and it covers insurance, building maintenance, Internet, Cable TV, 24/7 security and common areas upkeep. Guests will find themselves marveling at different art works and unique details throughout the hotel and socialize at the pool-side restaurant & bar. The Hotel experience is inherent throughout the project as a perfect balance of beauty, design and functionality. Abundant with natural light, the stylishly designed “Kitchen Suites” are complete with a master bedroom with a Queen Size double-pillow-top mattress, living area with a leather sofa-bed, fully-equipped Italian kitchen with exotic granite countertops, marble cladded bathroom and two balconies. With a spacious living and kitchen area, this 2 bedroom unit features two full bathrooms, three balconies and two entrance doors with a lock-off feature that allows this Condo to be split into 2 separate rental units. 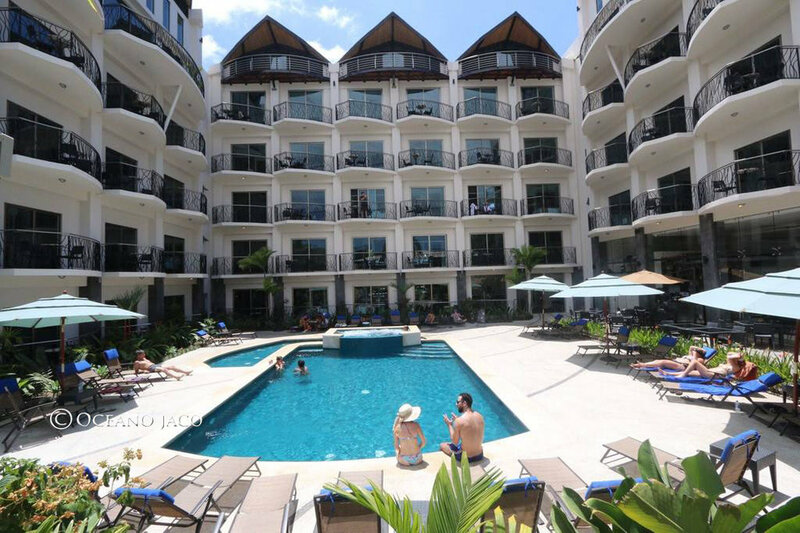 There are no more units of its kind left for sale at Oceano, as they are the best revenue generators and offer the unrivaled comfort to owners to use just one part of their unit during visits while continuously renting out the other half, basically allowing a constant revenue stream. The original owner of this unit has put it up for sale and asking for a cash-only buyer, it is priced at $240,000 USD. The sale price includes all furniture, appliances & artwork. This spacious suite comes with an extra-large living area, gorgeous marble cladded bathroom with double onyx sinks, the master bedroom balcony has a private plunge pool, there is a second extra-large balcony off the living room, as well as a fully-equipped Italian kitchen with granite countertops, washer & dryer, ACs and flat screen TV throughout. This unique suite is situated on the fourth floor overlooking all of Jaco and the ocean, the spacious master bedroom has an in suite marble cladded bathroom with double onyx sinks and a private plunge pool on the balcony, living are with an additional extra-large balcony, a fully-equipped Italian kitchen with truly exotic granite countertops, washer & dryer, ACs and flat screen TV throughout. The second bedroom has its own entrance door which allows this suite to be rented out as two separate rental units. The second bedroom is your standard hotel room with a double-pillow-top Queen Size mattress, 60” flat screen TV, mini-fridge & full bathroom. With unmatched mountain views and a steady breeze, Oceano’s unique Lofts can sleep up to 7 people. Situated below the hotel’s gorgeous curved roof formations, the Lofts enjoy extra-high ceilings, a spacious living area with a full-equipped kitchen, marble cladded bathroom with double access doors, master bedroom with Queen Size bed, 2 balconies, mezzanine with an additional Queen size bed and single bed that leads to a grand terrace. This two level Penthouse is a true gem, with incredible 180° uninterrupted mountain views, the outdoor living area that wraps around the entire PH is a marvel on its own right! This stunning PH is complete with 3 bedrooms, 3.5 bathrooms, fully-equipped large kitchen, office, pantry, XL wrap around balconies on both levels, 2 private plunge pools on balconies, truly luxurious marble cladded master bathroom with Jacuzzi & walk-in closet. This beautiful Penthouse boasts 180° uninterrupted mountain & city views, with wrap around balconies and a private plunge pool off the master bedroom. The second level of the PH is the entire master suite with a very large bedroom with a King Size bed, a stunning master bathroom complete with a Jacuzzi & walk-in closet. On the first level you will find a vast foyer and 2 additional bedrooms with in-suite bathrooms, a guest bathroom, fully-equipped kitchen, office, pantry and XL balconies throughout.